At risk: the Colorado River — water provider for 40 million people and vast swaths of cropland — which is already reeling from a crippling drought and rising water demands. Trump's proposed waters of the U.S. (WOTUS) rule would strip federal protections for ephemeral streams that only flow after rain or snow and wetlands without continuous surface water connections to waterways. That's particularly important in the Colorado River Basin. Ephemeral streams make up about 18 percent of waterways nationwide, but they are more common in seven Colorado River Basin states, where a boom-or-bust pattern of very wet years followed by drought prevails. In Nevada, 85 percent of streams are ephemeral; in New Mexico, 66 percent; and in Arizona, 51 percent, according to the U.S. Geological Survey. The other states in the river basin are Wyoming, Colorado, Utah and California. By allowing more development in wetlands and streams across the basin, experts say, the Trump rule could decrease both the quantity and quality of water entering the river. "Those small streams are a significant part of the hydrologic system, and if they are no longer protected by the Clean Water Act, the impacts could be quite horrendous in terms of quantity and quality," said Gene Reetz, who retired 10 years ago as a wetlands coordinator in EPA's Colorado-based Region 8, where his mission was trying to control salinity in the Colorado River. The Trump proposal comes as states try to finalize a contingency plan for drought in the Colorado River Basin. The river's headwaters in Rocky Mountain National Park will remain protected regardless of whether the WOTUS rule is finalized, but most of the river's tributaries would lose protection under the proposal because Colorado River states have widely varying protections. Most states have taken over at least some regulation of point sources of water pollution that enter waterways from discharge pipes, regulatory schemes that would make it easier to expand state protections. But New Mexico relies completely on the federal government to regulate such pollution. Only California and Nevada have their own programs regulating dredging and filling of wetlands and streams, which can damage downstream water quality and quantity. Wetlands serve as pollution sponges, soaking up contaminants before they enter waterways. They also buffer flooding in heavy storms and provide habitat for wildlife. California is the only state in the basin that protects more waterways and wetlands than the federal government. Five of the seven states have laws that would make creating programs to restrict dredging, filling and other destructive activities exceptionally difficult, including those that require state regulations to be in line with federal ones. Melinda Kassen, an attorney for the nonprofit Theodore Roosevelt Conservation Partnership, said those obstacles mean it's unlikely that Colorado River states will step up to fill in gaps left from the Trump administration's WOTUS proposal. "The notion that states will do the protecting — there is not a lot of evidence to support it," she said. Even if states had the political will to write completely new rules, funding would still be an issue. Kassen said there is little to suggest "the states have the bandwidth to do it." Any pollution in ephemeral streams — be it from point sources or from dredging and filling — damages water quality downstream, Reetz said. "The hydrological system is somewhat like our own circulatory system in the body," he said. "Tiny capillaries are connected to larger veins and organs, and if you do something to the capillaries — or to the ephemeral streams — ultimately, that will impact the health of the arteries." The Bureau of Reclamation has ordered a Jan. 31 deadline for the states to reach agreement on water cutbacks in the river basin when a shortage on the river is declared. A shortage could be declared as soon as next year and trigger reductions as soon as 2020. "If you add water quality into that equation, we could go from two-dimensional chess to three-dimensional chess," said James Eklund of the law firm Squire Patton Boggs, who serves as Colorado's principal on river issues. "Basinwide, water quality does matter, and it can matter substantially," he said. There are multiple programs in the basin that extend beyond state lines and are underpinned by federal water protections. One is a salinity control program, and another is a recovery regime for endangered fish. "If the states are left to fill the void on water quality," Eklund said, "we could face a patchwork of complexity that these programs have helped us avoid in other areas." 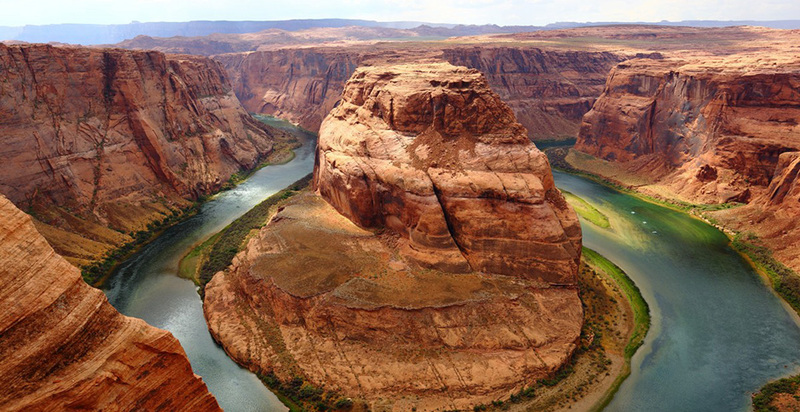 Salinity has long been a problem in the Colorado River, Reetz said, and allowing development of ephemeral streams could create an imbalance by destroying flows of fresh, clean water. Federal regulation of ephemeral streams doesn't always help Colorado River management. Jeff Kightlinger, general manager of the Metropolitan Water District of Southern California, said ephemeral stream management has been a constant problem along the Colorado River aqueduct, which delivers water to Southern California. At times, there have been up to 100 ephemeral streams crossing the 242-mile aqueduct, many of which only flow two days per year, he said. That has led to constant construction and reconstruction of berms to prevent the streams from reaching the aqueduct. "It became a difficult regulatory nightmare," said Kightlinger, whose agency is the country's largest water retailer, serving nearly 19 million people. Other advocates say leaving those ephemeral streams largely unprotected could have dire consequences. The mining of streams for minerals is not uncommon in ephemeral headwaters of the Colorado River, particularly in Colorado, Reetz said. "If those are no longer waters of the U.S., you wouldn't have treatment requirements for heavy metals going into those tributaries," he said. Extended drought is already causing headaches for Colorado River managers. With droughts expected to be more extreme and last longer due to climate change, more streams could be at risk of losing federal protection under the Trump rule as time goes on. The WOTUS proposal would maintain Clean Water Act protections for intermittent streams that only flow as snowpack melts or as the groundwater table rises to intersect with a streambed. The regulation would look at a rolling 30-year average of precipitation for an area to determine whether a stream flows independent of rainfall. But if drought in the West continues, groundwater tables could rise less often — and snow might not fall often enough to meet the administration's definition of snowpack. That means streams currently considered intermittent could eventually be fed solely by rain or snow fall — excluding them from Clean Water Act protection under the Trump rule. That's a predicament that makes Reetz "definitely concerned," he said. Those ephemeral streams only become more critical for Colorado River water quality and quantity as the drought continues, he said. That, in turn, is critical to making sure states can stick to whatever agreement they come to this winter. "They are already wrestling with this issue right now, and I really wonder, if push comes to shove, if the agreement will hold when it's really crunch time," he said. "This WOTUS proposal only complicates things."